Another early start. 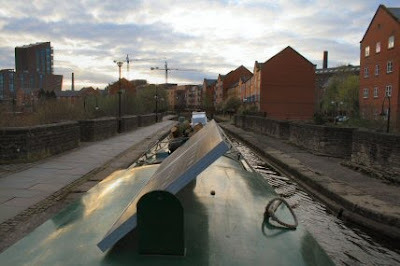 There have been many hints about the trouble caused by kids along this stretch of the Ashton canal. Best to get through early while they are either at school or in bed. Into the entrance of the Ashton and on the other side one starts to come across all the little wharfs or at least the remains of them. Just around the corner is the first one and its another without access. Perhaps one day they will put in a lift bridge or something. 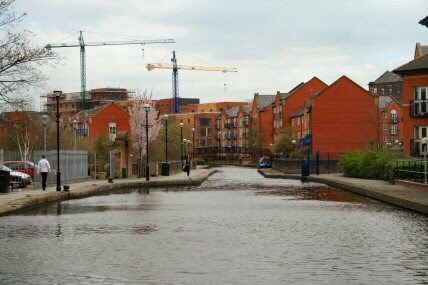 There has been a massive amount of regeneration along here and as you can see the area looks quite delightful and well looked after. 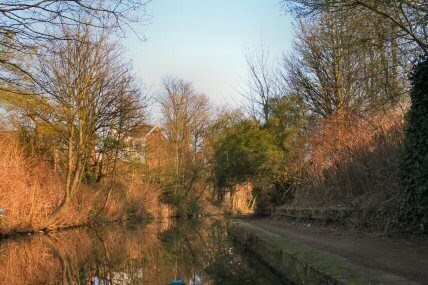 No rubbish in the canal and none on the towpath. The is an aqueduct here that takes the canal over a road. 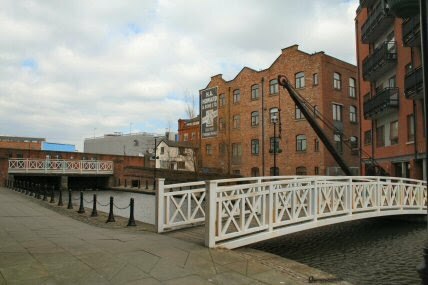 On each side there are refuges for walkers to get out of the way of the horses that would once have tramped their way along towing a barge. 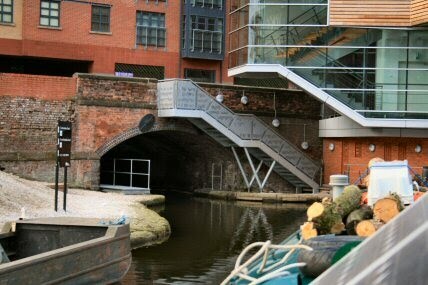 Even the new builds have a little wharf inside and a bit later on I saw where the land had been cleared to built more houses that they had incorporated and new canal into the site. 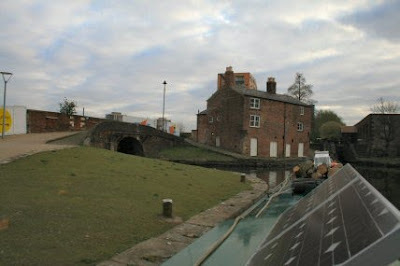 I am still not far from the city centre and by the look of the canal I could be miles from anywhere. 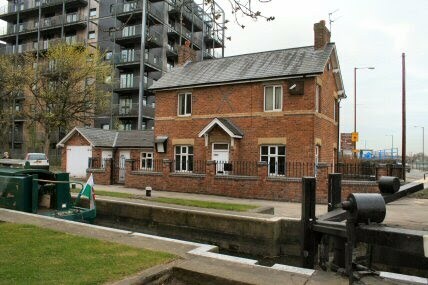 Another extinct arm off to a mill somewhere and a lockkeepers cottage all boarded up. 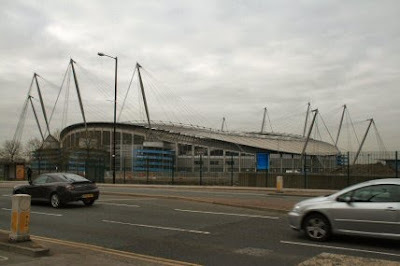 For a while the Manchester City stadium is in view. Another lockkeepers cottage but this time inhabited and looking very nice after a restoration. The arms keep coming up although this one is blanked off just after the bridge. Then we hit the rubbish. During the next eight locks I was too busy to take pictures. The total haul for the day was two jumpers, one duvet cover and a blanket. Each time I have to stop - usually mid stream - and open the weed hatch to get the prop clear. 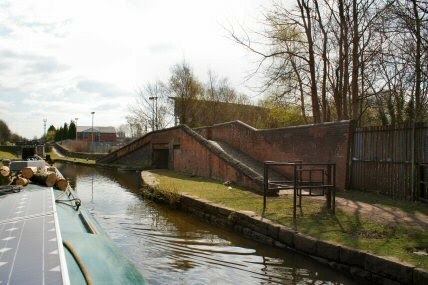 Lock 15 was the start of more problems. 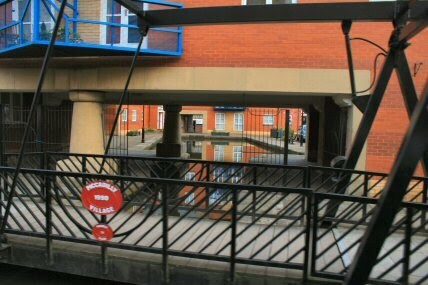 I got into the lock but the gates wouldn't close properly. Tried all ways to get them to fit but no luck. Ahead - because of the leaking top gate and the non-closure of the bottom gate the pound was very low in water. The BW where there asap after having trouble with gates further ahead. By the time they had arrived I had managed to dislodge whatever it was that was in the gates so at least water had stopped flowing down. Having been stuck at the lock for about an hour while things were sorted out another boat arrived astern of us and as we progressed - very slowly - every time they entered the lock below the water level dropped and I was aground or stopped after picking up rubbish. I spent half an hour chatting to people in their garden who were out enjoying the sun. Up till now there was no problem with kids and this looks ominous. However having smiled as I went under they just wandered off to do their own thing. But there is a problem with this lock. One of the sluices is half open and the water level low. I sit aground on the cill for a while unable to move but eventually the water is high enough to get in against the fast flow from the sluice. 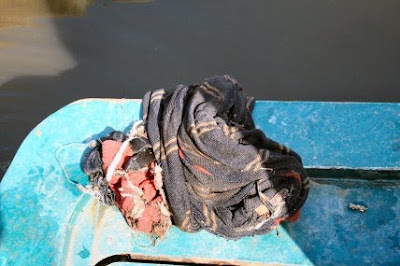 Having lifted the other sluice and filled the lock the problem sluice decided to work perfectly. 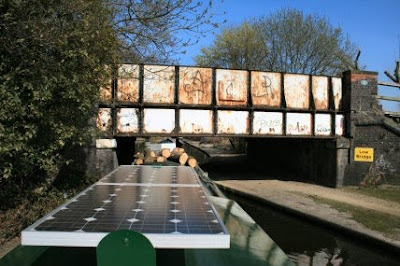 The only problem we have encountered on the Rochdale and the Ashton has been a lack of water. Only once has there been a problem with kids and that was near Rochdale and this I was told is where all the scumbags have gone from what were the problem areas of the Ashton. Bridge 21 is listed a low and low it is. A 12 inch chimney can get through but without the coolie hat. I took the wind genny down before we left this morning. And now it looks as though we are in another world. 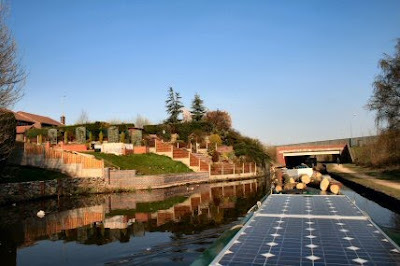 The houses here are using the canal as part of the house and looking after it. 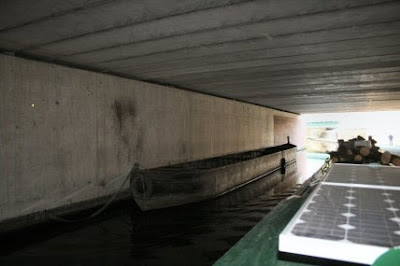 Ahead is the tunnel that goes under the motorway. As you get to the end the shape of an old butty comes into view and it looks rather ghostly in the half light. Probably awaiting renovation. And just the other side is a yard that has several old boats and some ancient machinery. Such as this tripod that looks in good nick and ready to start unloading any time now. 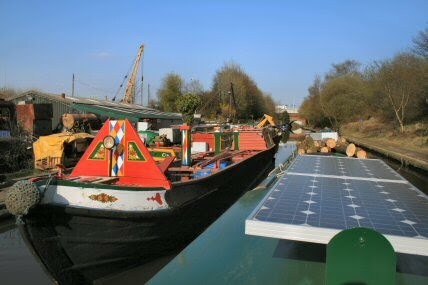 After ten hours we have had enough and this is the mooring for tonight. 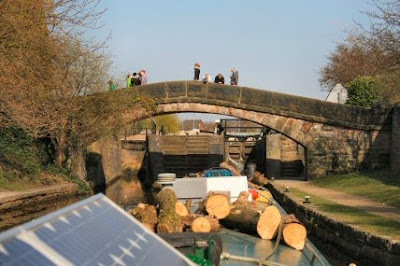 We have done 18 locks and 3 swing bridges. 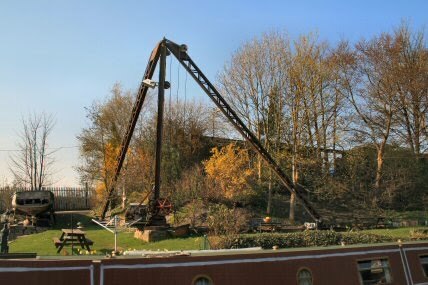 The swing bridges presented their own problems with some one hammering a wooden peg into the unlocking mechanism and stones off the towpath getting onto the rollers so that the bridge stuck half way open. There is no easy access to to the road above but just around the corner there is a scramble up the bank and a pub. I deserve a few pints tonight. Wow, you had an eventful passage. It will give you little comfort to know that we rolled up the Ashton last Sunday morning with nothing more than a couple of poly bags to hinder our progress. Like you, we had no trouble with kids and all the adjacent estates seem to have been emptied.